The simplest light detecting organs are composed of two cell types: the light sensitive photoreceptor cell and the pigmented cell. Both cell types appear in conjunction in every eye of the animal kingdom from insects, mollusca to higher vertebrates . Interactions between both the pigmented cells and the photoreceptor cells are essential for visual function [2-5]. 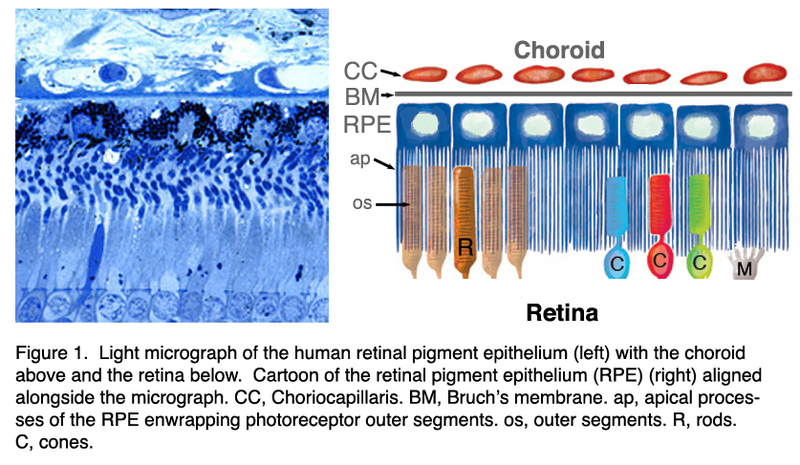 Already beginning in embryonic development, the functional differentiation of the photoreceptor layer and the retinal pigment epithelium layer (RPE) depend on each other [6, 7]. When the communication between the developing RPE and the developing neuronal retina is interrupted the RPE is able to form a multilayered retina-like structure by itself . The RPE and the neural retina co-differentiate during development of the eye. Parts of the RPE/ photoreceptor interaction such as importing the vitamin A derivitive, retinal, its metabolism and recycling are initiated before vision starts, and serve as differentiation signals for both tissues [9, 10]. Furthermore, analyses of hereditary types of retinal degeneration reveal a strong dependence of the RPE on the photoreceptors and vice versa. For example, mutations in genes which are expressed in the photoreceptor cells can lead to a primary RPE disease with secondary occurring loss of photoreceptors. Or, on the other hand, mutations in genes which are expressed in the RPE can lead to primary photoreceptor degeneration. Thus the ability of the photoreceptor cell to detect light depends on its interaction with the pigmented cell. In the vertebrate eye the RPE is located between the light-sensitive outer segments of the photoreceptors and blood supply of the choroid. It is a hexagonally packed, tight-junction, connected, single sheet of cells containing pigment granules (Figs 1 and 2, PG) and organelles for digestion of photoreceptor outer segment membranes into phagosomes (Fig. 2, Phagosomes, Ph). With its apical membrane and processes (Fig. 1, ap), it faces the subretinal space which is occupied by an extracellular matrix specialized to enable interaction between the RPE and the light sensitive outer segments of the photoreceptors (Figs. 1 and 2, os, ros) [11-14]. With its basolateral membrane, the RPE is in contact with the highly specialized multilayered Bruch’s membrane (Figs. 1and 2) which also represents an interaction matrix for the RPE with blood flow in the fenestrated vessels of the choroid (the choriocapillaris, CC Figs. 1 and 2) . Figure 3 shows a summary drawing of the pigment epithelium and its functional attributes that will be discussed in the following chapter. Figure 3. Summary diagram of the major functions of the RPE (from Strauss, 2005 ). The functions are: light absorption, epithelial transport, spatial ion buffering, visual cycle, phagocytosis, secretion and immune modulation. At a first glance, light absorption is the most obvious function of the RPE. The cells are heavily pigmented and cover the inner surface of the bulbus. As in a camera, it improves the quality of the optical system of the eye by absorbing scattered light. For a long time this function was believed to be the only one by the RPE. Now we know of a great many other functions of the RPE (see above, Fig. 3). In the human eye, light is focused by a lens onto the cells of the macula resulting in a strong concentration of photo-oxidative energy in the retina [16-18]. Furthermore, the choroid is a tissue which shows a higher specific blood perfusion than the kidney [19-22]. But, the oxygen extraction by the retina during the passage through the choroid is relatively low. The venous blood from the choroid still shows an oxygen saturation of more than 90%. Thus the RPE is exposed from the retinal side to a strong photo-oxidative energy and from the blood side by an overflow of oxygen. Photo-oxidation leads to damage of the photoreceptor outer segment tips so they need a constant renewal process from their base (see Photoreceptor chapter, Part II, Webvision) (described below in section 6). The renewal process however involves the phagocytosis of destroyed and shed photoreceptor outer segments by the RPE. This adds a strong load of free radicals in addition to the high photo-oxidative environment. Thus the RPE has to be capable of maintaining the structural integrity of the retina by an efficient defense against free radicals, photo-oxidative exposure and light energy [16-18]. C [23, 24]. It is possible that the high perfusion of the choroid serves to transport away the heat from the retina. Further lines of defense are high concentrations of non-enzymatic and enzymatic anti-oxidants and the ability of the cells to repair damaged lipids, proteins and DNA. In man, these mechanisms provide protection of the photoreceptor/RPE/choroid complex and maintenance of the structural integrity of this complex for decades. However, it is known that the human retina accumulates lipofuscin (an end product of phagosome breakdown) during its life-time, beginning at a young age. This accumulation debilitates the RPE cells and their lines of defense become weaker over time [17, 25-29]. It is believed that a reduced capability to absorb light and to compensate for oxidative damage are important factors initiating the chain of events leading to the onset of age-related macular degeneration in the older population (see chapter on AMD by Hageman et al, Webvision). So the RPE forms a tight-junction epithelium located between the blood flow of the choroid and the outer segments of the photoreceptors. There are tight junction between the lateral surfaces of the hexagonal epithelial sheet (Fig. 2, TJ) [4, 30, 31]. In this way the RPE forms a part of the blood/retina barrier. The barrier function by a tight epithelium implies an efficient isolation of the inner retina from systemic influences at the choroidal side. This is of importance for the immune privilege of the eye (see section 8) and for a highly selective transport between the blood and the subretinal space. This epithelial transport serves to supply nutrients to the photoreceptors (transport from the blood to the retinal side), control the ion homeostasis in the subretinal space and to eliminate water and metabolites from retinal tissue (transport from the retinal to the blood side). The photoreceptors are highly specialized cells which need the supply of essential metabolites. These are glucose for energy metabolism, retinal for the visual cycle of the opsins and ω-3 fatty acids for specialized phospholipids to compose the membranes of photoreceptors which are highly enriched by ω-3 fatty acids. All these nutrients are taken up by the RPE and are transported to the photoreceptors. To transport glucose the RPE expresses the glucose transporters GLUT1 and GLUT3 in both the apical and basolateral membrane [32, 33]. GLUT3 serves for the basic transport whereas GLUT1 is responsible for an inducible transport system to meet metabolic needs. The transport of retinal starts with uptake of retinol from the blood and is then transferred into the visual cycle of retinal which is described below (Section 5). To transport ω-3 fatty acids, the RPE preferentially takes up 22:6ω3 fatty acid in a concentration dependent manner [34, 35]. Inside the RPE the compound is incorporated into glycerolipids for synthesis, storage and subsequent delivery in a recycling process involving the phagocytotic process (see Section 6). Mainly water, ions and metabolic end products are transported from the retinal side to the blood side [4, 30, 31, 36, 37]. The retina is the tissue with the highest cell density in the human body. The photoreceptors, neurons and glial cells, have a high metabolic turn-over rate leading to production of metabolic water which accumulates in the retina. In addition, intraocular pressure drives a movement of water from the anterior eye towards the retina where it accumulates. Furthermore, a large part of the metabolic activity of retinal cells results in the production of lactic acid. Up to 19 mM lactic acid concentration has been reported in the subretinal space . Figure 4. Epithelial transport and pH regulation in RPE cells. 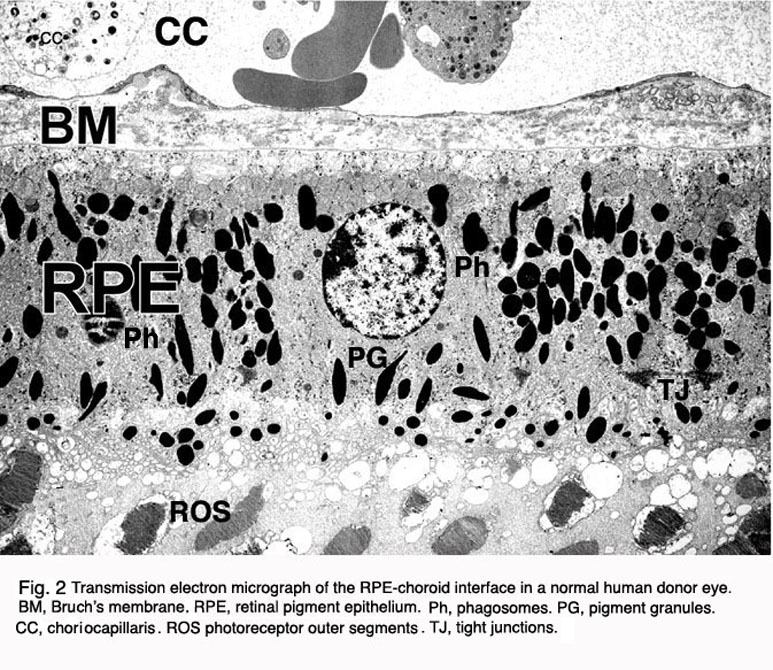 A. Transepithelial transport of ions across the RPE: Cl– is predominantly transported from the subretinal space to the choriocapillaris. This transport drives water through aquaporins from the subretinal space to the choriocapillaris. The driving force for epithelial transport is provided by the apically located Na+/K+-ATPase. K+ transported by the ATPase recycles through the apical membrane and facilitates establishment of a Na+ gradient into the cell. The Na+ gradient serves to drive uptake K+ and Cl– on the apical side resulting in a high intracellular Cl– activity. Cl– is extruded from the cell on the basolateral side through Cl– channels. The efficiency Cl– extrusion from the cell is reduced by activity of a Cl–/HCO3– exchanger which transports Cl– back into the cell. B) Transport of lactic acid and pH regulation: Lactic acid is removed from the subretinal space by the lac–/H+ cotransporter. Through the basolateral membrane lactic acid leaves the cell using a different subtype of lac-/H+ cotransporter. The necessary pH regulation occurs using a Na+/H+ exchanger and a Na+/HCO3– exchanger in the apical membrane and a Cl–/HCO3– exchanger at the basolateral membrane. The activity of Cl–/HCO3– exchanger is supported by basolateral Cl– channels which result in a cycling of Cl– across the basolateral membrane. In the case of intracellular acidification the Cl–/HCO3– exchanger is inhibited whereas Cl– channels are activated. This increases the net water transport. Abbreviations: ClC–2, voltage-dependent Cl channels of the ClC family; CFTR, cystic fibrosis transmembrane conductance regulator; Kir7.1, inwardly rectifying K+ channel 7.1; maxi-K, large conductance Ca2+-dependent K+ channel; MCT1, monocarboxylate transporter 1; MCT3, monocarboxylate transporter 3. (From Strauss, 2005 ). 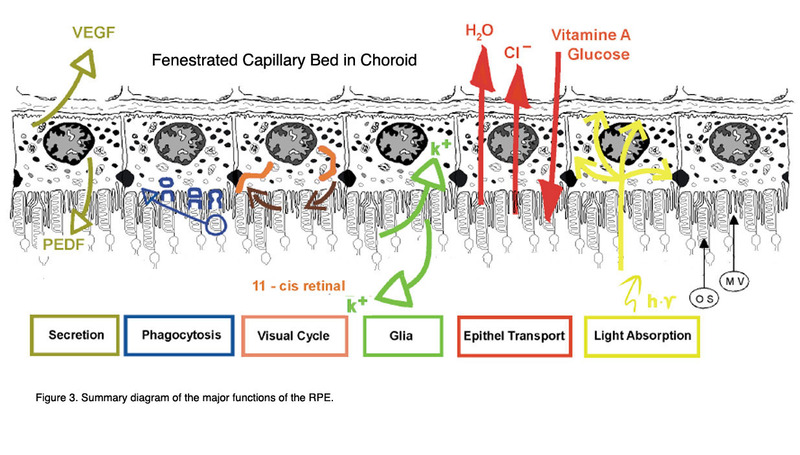 Water is eliminated from subretinal space by active transport by the RPE. The transportation rate was estimated to range from 1.4 to 11 µl x cm-2 x h-1 [39-41]. This transport of water is driven by a transepithelial transport of Cl- from subretinal space to the blood side through the RPE (Fig. 4A). The Cl- transport is an active transport driven by the activity of the apically localized Na+/K+-ATPase which uses the energy of ATP to transport 3 Na+ in exchange for 2 Ka+ against concentration gradients out of RPE cells. The K+ ions which are transported into the cytoplasm recycle through apically localized Kir7.1 inward rectifier K+ channels into the subretinal space . This results in a gradient for Na+ into the RPE cell which has a low intracellular Na+ concentration. 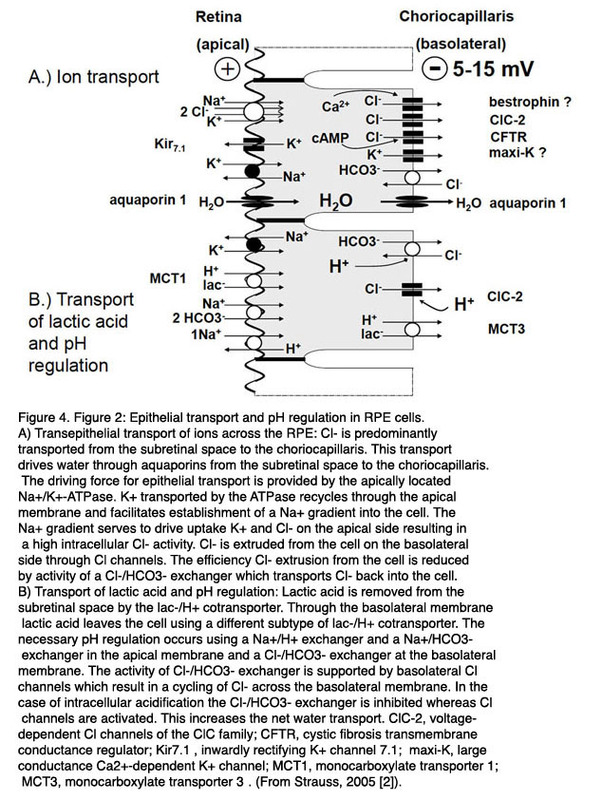 The recycling of K+ back into the subretinal space through inward rectifier K+ channels enhances the transport efficiency by the Na+/K+-ATPase because it decrease the gradient for K+ across the apical membrane of the RPE . The reason why the Na+/K+-ATPase is apically located is not clear. As will be explained below in Section 4, it probably serves to maintain the ion homeostasis in the subretinal space by spatial buffering of ions. The Cl-driven transport of water establishes an adhesion force between the RPE and the neuronal retina which is removed by blocking the Na+/K+-ATPase with Ouabain . The transportation pathway begins with an uptake of Cl- from subretinal space across the apical membrane of the RPE cells. Driven by the gradient for Na+ which is established by the Na+/K+-ATPase, Cl- is taken into the cell across the apical membrane by the activity of the Na+/K+/2Cl- co-transporter [4, 30, 36, 45]. Since K+ recycles back through apical inward rectifier channels into the subretinal space and Na+is transported out of the cell by the Na+/K+-ATPase, the transport activity of the Na+/K+/2Cl- co-transporter results mainly in an accumulation of Cl- inside RPE cells. Depending on the species, the intracellular Cl- activity ranges from 20 – 60 mM [46-48]. Since the basolateral membrane has a large Cl- conductance the Cl- which accumulates in the intracellular space of the RPE leaves the cell across the basolateral membrane to the blood side. This results in a basolateral negative transepithelial potential ranging between 5 -15 mV [30, 31]. A crucial step in this transport pathway is the basolateral membrane conductance for Cl-. Thus mechanisms which regulate the efflux pathway across the basolateral membrane regulate the overall epithelial transport of Cl- across the RPE. For this purpose, different types of Cl- channels, which differ in their activation mechanisms to link Cl- conductance to different second-messenger pathways of RPE cells, are localize in the basolateral membrane. A basic transportation rate seems to be provided by the ClC-2 Cl- channel . In a knock-out mouse model for ClC-2 Cl- channels, the absence of a transepithelial potential is observed and the mice become blind, showing a phenotype comparable to that of Retinitis pigmentosa . Other basolateral Cl- channel might be CFTR (cystic fibrosis transmembrane regulator) which enable a cAMP-dependent modulation of the Cl- transport across the basolateral membrane [50, 51] and a Ca2+-dependent Cl- channel which enable a regulation of the transport by changes in intracellular Ca2+. The molecular identity of this Cl- channel is possibly bestrophin-1 . As mentioned above the metabolic activity results in large concentrations of lactic acid in the subretinal space. Lactic acid is eliminated from subretinal space by the RPE [37, 53] (Fig. 4B). Uptake of lactic acid occurs across the apical membrane of the RPE by the mono-carboxylate transporter-1 MCT1 and the release of lactic acid to the blood side across the basolateral membrane occurs via the activity of the mono-carboxylate transporter-3 (MCT3). The transport of lactic acid requires an efficient pH regulation and an adaptation of the volume transport because a large amount of transported water is metabolic water. The pH regulation of the RPE cells involves the activity of Na+ coupled, secondary active transport mechanisms of the apical membrane of the RPE [54, 55]. H+ ions are removed from the cytoplasm by the Na+/H+-exchanger and HCO3– is accumulated in the cytosol by the transport activity of the Na+/2HCO3– co-transporter . At the basolateral membrane of the RPE, a HCO3–/Cl– exchanger interferes with control of intracellular HCO3– by the apical Na+/2HCO3– co-transporter. At high pH the RPE transports HCO3– from subretinal space to the blood side. At low pH the basolateral HCO3–/Cl– exchanger is stimulated, which increases the intracellular HCO3– concentration and HCO3– released to the subretinal space across the apical membrane by the activity of the Na+/HCO3– co-transporter, which runs then in the reverse mode. The involvement of the HCO3-/Cl- exchanger at the basolateral membrane links the water transport to the pH regulation and therefore to the transport of lactic acid [46, 47, 56-62]. At resting conditions, the HCO3-/Cl- exchanger in the basolateral membrane reduces the transportation rate of Cl- across the basolateral membrane, and therefore, the transepithelial transport of volume, because a small amount of Cl-which leaves the cell, through basolateral Cl- channels, is transported back into the intracellular space by the activity of the HCO3-/Cl- exchanger. At low pH the HCO3-/Cl- exchanger transports Cl- out of the cell to take up HCO3- for pH regulation, which in turn leads to increase of Cl- and volume transport. This is supported by the pH sensitivity of basolateral ClC-2 Cl channel which increases its activity by a decrease of extracellular pH. The fact that the transport of volume is linked to the HCO3- transport is used in the treatment of macular edema. Application of inhibitors of carbonic anhydrase increases the speed of volume resorption by the RPE [62, 63]. The transport of osmolytes across the RPE from subretinal space to the blood side establishes an osmotic driving force for water across the RPE. The RPE is a tight epithelium which means that the transport of water cannot occur through any paracellular transportation route. All transported volume has to take the transcellular route. For this purpose the RPE expresses aquaporine-1 water channels which are localized in both the basolateral and the apical membrane of the RPE [64, 65]. However it has also been suggested that the mono-carboxylate transporters are able to transport water. As described above, the RPE maintains the ion homeostasis of the subretinal space by epithelial transport of ions. However, the light-dependent changes of the photoreceptor activity and the activity of the second order neurons lead to very fast changes in the subretinal space, which requires a fast and capacitative compensation by the RPE . If these changes were not compensated for, the overall excitability of the photoreceptors and the neurons would quickly change and proper signal transduction of visual information would not be possible. The normal transepithelial transport of ions would be too slow to compensate quickly enough for these changes. Other mechanisms based on the activity of voltage-dependent ion channels add to the basic transepithelial transport of ions. In this process the compensation for changes in the subretinal K+ concentration and retinal volume are most important. In the dark cGMP-gated cation channels are open in the outer segments of photoreceptors. The influx of Na+ and Ca2+ through these channels is counterbalanced by an outflow of K+ at the inner segment. These ionic currents represent the so called dark current . When light falls onto photoreceptor outer segments, the cGMP-dependent cation channels are closed and the K+ outflow at the inner segment becomes smaller. At the same time Na+/K+-ATPase at the inner segment takes up K+ into the photoreceptor. This results in a reduction of the K+ concentration in the subretinal space from 5 mM to 2 mM [4, 66]. This decrease is compensated for by the RPE. The mechanism is based on the fact that the ion conductance of the apical membrane of the RPE is dominated by a K+conductance . The light-induced decrease in the subretinal K+ concentration leads to hyperpolarization of the apical RPE membrane. This in turn leads to activation of inward rectifier K+ channels generating an efflux of K+ into the subretinal space, and to an increase of the subretinal K+ concentration back to normal values . For this purpose the RPE expresses Kir7.1 channels located in the apical membrane of the RPE . Kir7.1 channels were found to display a rather mild rectification but show increased conductance when extracellular K+ is decreased. This makes these K+ channels the ideal candidates for this function [42, 70]. This compensatory pathway enables fast reactions of the RPE to either decreases or increase in the subretinal K+ concentration. A model, which has been developed by LaCour, explains the compensation of K+ concentration changes by epithelial transport by a rather small transepithelial K+ transport from subretinal space to the blood side under control conditions [68, 71]. The major part of K+ which is taken up across the apical membrane, via the activity of the Na+/K+/2Cl- co-transporter, recycles back into subretinal space through apical K+ channels. A smaller part leaves the cell across the basolateral membrane to the blood side. In the case of a decrease of the subretinal K+ concentration, apical membrane conductance for K+ increases. This leads to an increases in the proportion of K+ which recycles back to the subretinal space and, subsequently, to further decrease in the transepithelial transport of K+ by the RPE. In the situation where the subretinal K+ concentration increases, the apical membrane conductance decreases due to inactivation of Kir7.1 channels and due to depolarization of the apical membrane. Now a smaller proportion of K+which is taken up across the apical membrane can recycle back to the subretinal space. This increases the amount of K+ which is transported across the RPE to the blood side. Due to the fast coupling of K+concentration with apical transmembrane potential, and ion conductance, the RPE is able to respond to changes in the subretinal K+ concentration as fast as they occur. When the retina is stimulated by light, a small and transient change in the extracellular volume in the retina is observed [36, 72]. These changes are compensated for by MŸller glia cells in the inner retina and by the RPE at the outer retina. Again the compensation mechanism is a fast reaction which adds to the sustained transepithelial transport by the RPE, in this case the transport of water. The fast coupling is again enabled by voltage-dependent modulation of ion transport. As described above the transport of water into the RPE is driven by a transepithelial transport of Cl- which is linked to the transport of HCO3-and lactate. The light-dependent modulation of water transport is based on the fact that the apical Na+/HCO3- co-transporter is electrogenic. This means that this transportation activity is not electroneutral because it does not transport an equivalent amount of positive and negative charges [56, 73-75]. The light-dependent hyperpolarisation of the apical membrane reduces the transport rate of Na+/HCO3- co-transporter which in turn leads to intracellular acidification. As described above the water transport can be enhanced by intracellular acidification which leads to an increased efflux of Cl- across the basolateral membrane of the RPE. Vision starts with the absorption of a photon by the chromophore of rhodopsin, 11-cis retinal [67, 76-78]. After absorption of a photon 11-cis retinal has changed its conformation into all-trans retinal and rhodopsin becomes meta-rhodopsin in a defined time before its activity is terminated by phosphorylation. After additional reaction steps, rhodopsin is able to exchange all-trans retinal for 11-cis retinal and it can be activated again by a photon. Thus all-trans retinal needs to be re-isomerized to ensure a sufficient delivery of 11-cis retinal for all visual needs and proper visual function [1, 79]. Since photoreceptors do no express a re-isomerase for all-trans retinal, the re-isomerization takes place in the RPE. For this purpose all-trans retinal is delivered to the RPE, re-isomerised to 11-cis retinal and delivered back to photoreceptors. This process is called the visual cycle of retinal [80-82, see also the chapter on Phototransduction, Part V in Webvision]. The visual cycle for rods occurs via the RPE (Fig. 5). The visual cycle for cones is less clear. It can be that part of the cone all-trans retinal is recycled by the RPE and part is recycled by Muller glia cells. Figure 5. The visual cycle (adapted from Thompson and Gal (597). Light transduction starts with photon absorption by rhodopsin. The process of light absorption underlies the stereochemical change of 11-cis retinal into all-trans retinal. All-trans retinal is metabolized into all-trans retinol and transported to the RPE. In the RPE retinol re-isomerized to 11-cis retinal and then redelivered to the photoreceptors. The regeneration seems to follow two pathways. One occurs through an as yet unidentified enzyme thought to function as a isomerohydrolase. 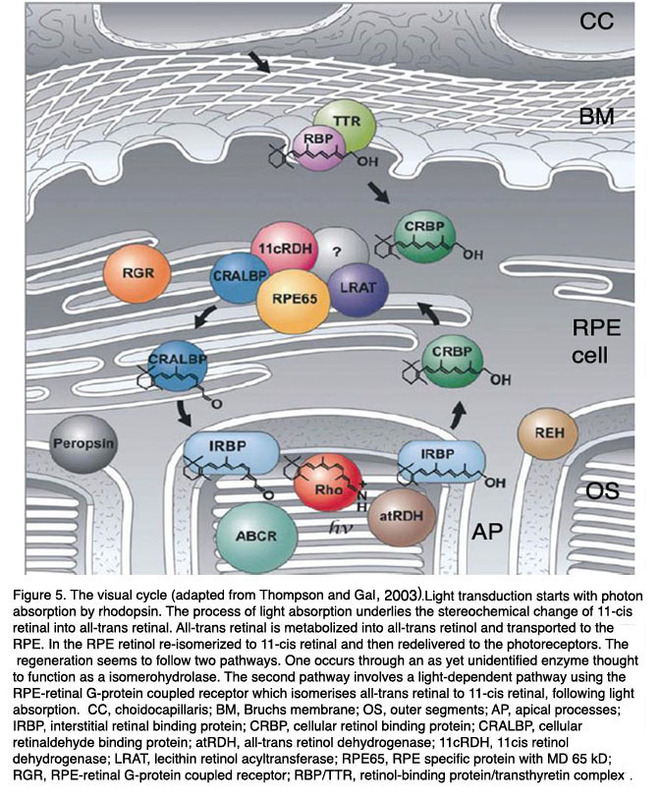 The second pathway involves a light-dependent pathway using the RPE-retinal G-protein coupled receptor which isomerises all-trans retinal to 11-cis retinal, following light absorption. Abbreviations: CC, choidocapillaris; BM, Bruchs membrane; OS, outer segments; AP, apical processes; IRBP, interstitial retinal binding protein; CRBP, cellular retinol binding protein; CRALBP, cellular retinaldehyde binding protein; atRDH, all-trans retinol dehydrogenase; 11cRDH, 11cis retinol dehydrogenase; LRAT, lecithin retinol acyltransferase; RPE65, RPE specific protein with MD 65 kD; RGR, RPE-retinal G-protein coupled receptor; RBP/TTR, retinol-binding protein/transthyretin complex. (Adapted from Thompson and Gal, 2003 ). The visual cycle of rods starts in the discs in the outer segments where all-trans retinal is transferred from the intradiscal space to the cytosolic space of the rod outer segment by an ATP-driven flippase ABCR or ABCA4 (ATP-binding cassette protein). This step involves the reaction of all-trans-retinal with phosphatidylethanolamine to N-retinylidine-phosphatidylethanolamine. In the next step all-trans retinal is reduced to all-trans retinol by a membrane bound retinol-dehydrogenase and is delivered to the subretinal space where it is loaded to IRBP (interstitial retinal binding protein), a carrier protein, and transported to the RPE. After uptake into the RPE all-trans retinol is transferred to CRBP (cellular retinol binding protein) which delivers all-trans retinol to a protein complex of several enzymes. This complex consists of LRAT (lecithin:retinol transferase), RPE65 (RPE protein with 65 kDa) and RDH5 (11-cis-retinol dehydrogenase). The three enzymes catalyze the three step reaction from all-trans retinol to 11-cis retinal: esterification of retinol by adding an aycl-group (LRAT), re-isomerisation to 11-cis using the energy from ester-hydrolysis (RPE65) and oxidation to 11-cis retinal (RDH5). The reaction is accelerated by CRALBP (cellular retinylaldehyde-binding protein) which is also part of the enzyme complex and to which 11-cis retinal is immediately transferred. From CRALBP 11-cis retinal is released to IRBP and transported back to photoreceptors. The exact mechanisms by which all-trans retinol enters the RPE and by which 11-cis retinal leaves the RPE are not clear. The visual cycle fulfills an essential task of maintaining visual function and needs therefore to be adapted to different visual needs such as vision in darkness or lightness [1, 79]. For this, functional aspects come into play: the storage of retinal and the adaption of the reaction speed. Basically vision at low light intensities requires a lower turn-over rate of the visual cycle whereas during light the turn-over rate is much higher. In the transition from darkness to light suddenly, large amount of 11-cis retinal is required. 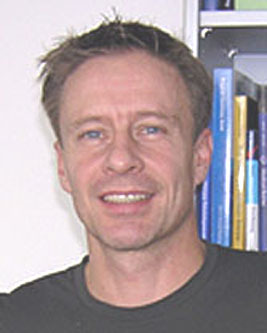 This comes not directly from the visual cycle but from several retinal pools of retinal binding proteins which are connected to each other by the transportation and reaction steps of the visual cycle. The first pool is the amount of 11-cis retinal which is in the rod outer segments. When the level of this pool is reduced, then the refilling of this pool is started by uptake of retinal from the next pool: the IRBP in the subretinal space. A drop in the retinal level of this pool is refilled from CRALBP which can be refilled from RPE65. With the connected pools for 11-cis retinal the changes in illumination can quickly be adapted. Thus, the RPE plays a crucial role in visual function, in the light adaptation. RPE65 plays a double crucial role in the visual cycle [83, 84]. On one hand it catalyses the re-isomerization reaction at light conditions. In the dark it function as retinol binding protein and represents an important retinol pool for the visual cycle. RPE65 combines both essential functions for adaptation of the visual cycle: storage and enzyme reaction. As mentioned above the light-sensitive photoreceptor outer segments (POS) goes through a constant destruction due to photo-oxidative damage. To maintain vision, the POS are constantly renewed by shedding the destroyed tips of the POS and by phagocytosis of the POS by the retinal pigment epithelium [3, 4, 85-89]. This is a diurnally regulated process which takes place in the morning and is triggered by light [86-88, 90-93]. It takes approximately eleven days to renew the whole length of the photoreceptor outer segment. Night active or day active animals show the same diurnal rhythm of phagocytosis . In this process the proper length of the photoreceptor outer segments is maintained by a coordinated activity of phagocytosis and POS shedding. The process is not only regulated by the circadian rhythm but also by coordination between the RPE and the photoreceptors. Figure 6. Phagocytosis.The figure shows the molecules involved in the initiation of photoreceptor outer segment phagocytosis. The initiation starts with binding of photoreceptor outer segment membranes. 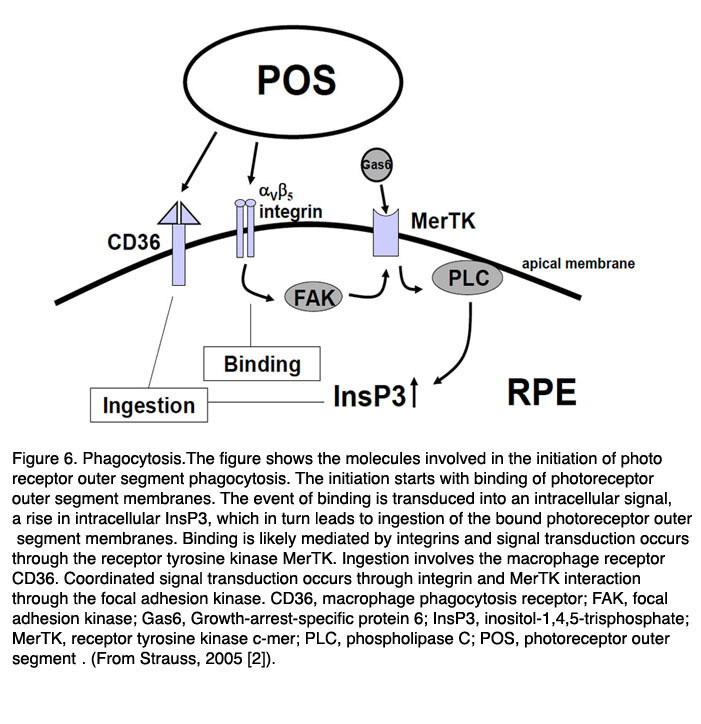 The event of binding is transduced into an intracellular signal, a rise in intracellular InsP3, which in turn leads to ingestion of the bound photoreceptor outer segment membranes. Binding is likely mediated by integrins and signal transduction occurs through the receptor tyrosine kinase MerTK. Ingestion involves the macrophage receptor CD36. Coordinated signal transduction occurs through integrin and MerTK interaction through the focal adhesion kinase. Abbreviations: CD36, macrophage phagocytosis receptor; FAK, focal adhesion kinase; Gas6, Growth-arrest-specific protein 6; InsP3, inositol-1,4,5-trisphosphate; MerTK, receptor tyrosine kinase c-mer; PLC, phospholipase C; POS, photoreceptor outer segment. (From Strauss, 2005 ). Primarily three receptors have been identified to be involved in the regulation of phagocytosis of POS by the RPE (Fig. 6, above): CD36, receptor-tyrosinekinase c-mer (MerTK) and αVβ5 integrin [95-102]. Basically CD36 is required for the process of POS internalization, MerTK is required to activate the phagocytosis and αVβ5 integrin is required for binding of POS, and for the initiation of the phagocytosis in the diurnal state. The interplay between these receptors ensures regulated and coordinated POS phagocytosis. The relevance of these receptor molecules in the cell membrane was unraveled in the phenotypes of different knock-out animals. A loss of MerTk leads to human Retinitis pigmentosa and to a comparable type of retinal degeneration in the Royal College of Surgeons (RCS) rat which represents the oldest animal model for inherited retinal degeneration [100-102]. The loss of β5-integrin leads to a loss of circadian regulation of phagocytosis with a subsequent late onset of lipofuscin accumulation in the RPE [97-99]. It is not known what signaling molecule enables the communication between the RPE and the photoreceptors at the start of phagocytosis. It may be that the presence of the shed POS is sufficient to initiate the phagocytosis . The first step in this process is the binding of POS to the RPE through the αVβ5 integrin. The secreted glycoprotein milk fat globule-EGF8 (MFG-8), which is expressed by the RPE and can activate αVβ5 integrin, seems to be an important activator of diurnal stimulation of phagocytosis [104-106]. Activation of the integrin produces an intracellular signaling cascade which involves focal adhesion kinase (FAK) . FAK is able to phosphorylate MerTK which can now be activated. The activation mechanism for MerTK is not clear. The natural ligand for MerTK is a protein called Gas6 (growth-arrest-specific protein 6). Gas6 is found in the retina and is strongly expressed by the RPE . Thus it can be that the Gas6 is an autocrine stimulator of phagocytosis by the RPE. However a recent publication suggested that probably another ligand for MerTk is playing a role. In this publication it was shown that the tubby and tubby-like proteins, which are found in photoreceptors, can bind to MerTK and represent “eat-me” signals for the process of phagocytosis by RPE cells (and also for macrophages) . Activation of MerTK results in an intracellular signaling cascade which involves the generation of inositol-1,4,5-trisphosphate (InsP3) and a subsequent increase in intracellular free Ca2+. The phagocytosis by itself is enabled by the phagocytosis receptor CD36. The RPE is an epithelium which closely interacts with photoreceptors on one side but must also be able to interact with cells on the blood side of the epithelium, such as endothelial cells or cells of the immune system. In order to communicate with the neighboring tissues the RPE is able to secrete a large variety of factors and signaling molecules. It secretes ATP, fas-ligand (fas-L), fibroblast growth factors (FGF-1, FGF-2, and FGF-5), transforming growth factor-β (TGF-β), insulin-like growth factor-1 (IGF-1), ciliary neurotrophic factor (CNTF), platelet-derived growth factor (PDGF), vascular endothelial growth factor (VEGF), lens epithelium-derived growth factor (LEDGF), members of the interleukin family, tissue inhibitor of matrix metalloprotease (TIMP) and pigment epithelium-derived factor (PEDF) . In the healthy eye some of these factors are constantly released and help to maintain the structural integrity of the neighboring tissues. 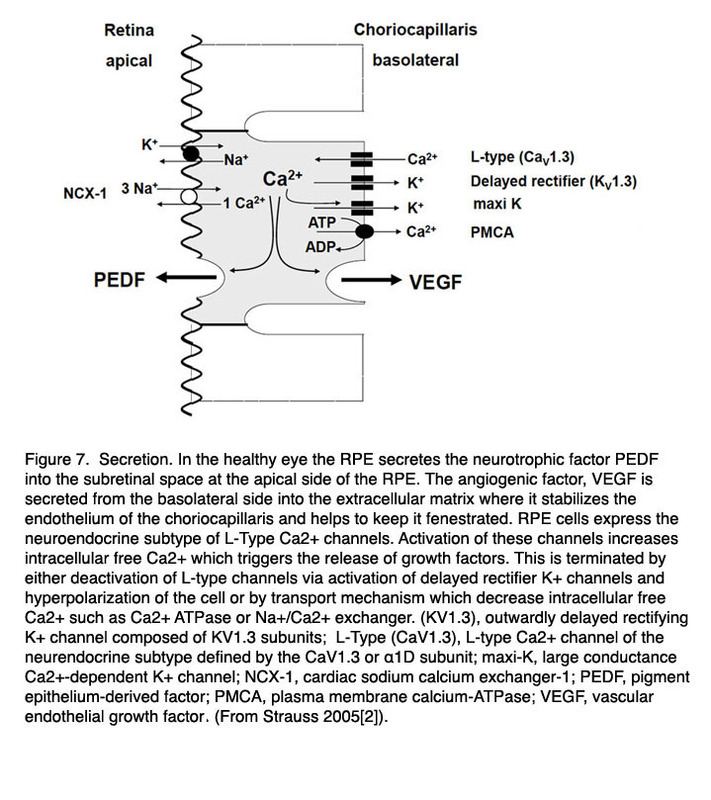 PEDF is for example a neurotrophic factor which is secreted to the apical/retinal side of the RPE to stabilize the neuronal retina by prevention of apoptosis [109-111]. VEGF and TIMP are secreted to the basolateral side of the RPE and are required to stabilize the fenestrated structure of the endothelium of the choroid . Other factors are activated when the retina or the RPE are exposed to pathological conditions such as hypoxia or metabolic stress. In order to enable a finely regulated secretory activity of the RPE in health and disease the RPE expresses a number of Ca2+-dependent regulatory mechanisms  (Figs. 7 and 8). If the regulation of secretion fails under certain pathologies then the RPE will promote proliferative diseases such as choroidal neovascularisation. Figure 7. In the healthy eye the RPE secretes the neurotrophic factor PEDF into the subretinal space at the apical side of the RPE. The angiogenic factor, VEGF is secreted from the basolateral side into the extracellular matrix where it stabilizes the endothelium of the choriocapillaris and helps to keep it fenestrated. RPE cells express the neuroendocrine subtype of L-Type Ca2+ channels. Activation of these channels increases intracellular free Ca2+ which triggers the release of growth factors. This is terminated by either deactivation of L-type channels via activation of delayed rectifier K+ channels and hyperpolarization of the cell or by transport mechanism which decrease intracellular free Ca2+ such as Ca2+ ATPase or Na+/Ca2+ exchanger. Abbreviations: Delayed rectifier (KV1.3), outwardly delayed rectifying K+ channel composed of KV1.3 subunits; L-Type (CaV1.3), L-type Ca2+ channel of the neurendocrine subtype defined by the CaV1.3 or α1D subunit; maxi-K, large conductance Ca2+-dependent K+ channel; NCX-1, cardiac sodium calcium exchanger-1; PEDF, pigment epithelium-derived factor; PMCA, plasma membrane calcium-ATPase; VEGF, vascular endothelial growth factor. (From Strauss 2005). The main trigger of secretory activity in the RPE is an increase in intracellular free Ca2+ second-messengers. 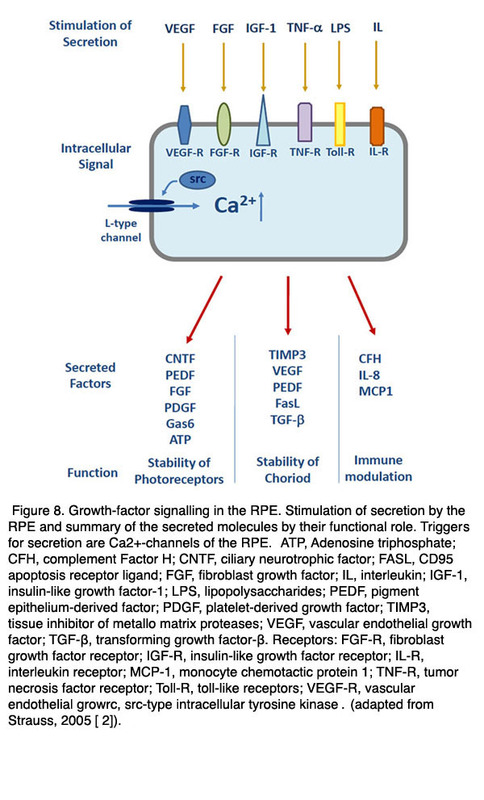 In order to regulate secretion specific for the different factors, the RPE expresses a large number of different ion channels or transporters which increase intracellular free Ca2+. As in many other secretory tissues such as the beta-cells of the pancreas or neuroendocrine cells, the RPE expresses voltage-dependent Ca2+ channels of the neuroendocrine subtype. The latter are composed of the CaV1.3 subtype [114-116]. In the RPE the L-Type channel is regulated by either cytosolic tyrosine kinases, such as src-type kinase, or by receptor tyrosine kinase, such as the FGF receptor FGFR-2 [117-119]. Since a large number of factors are known to increase secretion by the RPE acting via tyrosine kinase, the L-type channel regulates of number of different factors. Another Ca2+ channel, which is thought to be involved in the regulation of growth-factor secretion by the RPE, is the TRPV2 channel (transient-receptor-potential channel, vanilloid subtype) . Activation of this channel leads to an increased secretion of VEGF by the RPE. It seems that mainly the IGF-1 stimulated VEGF is increased by a signal cascade involving the activation of TRPV2. This ion channel is an interesting candidate for understanding some clinical observations. TRPV2 channels can be activated by heat. And heat-dependent activation of TRPV2 channels can stimulate the secretion of VEGF. Laser treatment which causes an increase in the temperature of the RPE is often used in the treatment of degenerations such as AMD or diabetic retinopathy. This same laser treatment most probably causes an increase in the secretion of growth-factors from the RPE and it may be that TRPV2 activation is permitting this secretion. The inner eye represents an immune privileged space which is disconnected from the immune system of the blood stream [121-123]. The immune privilege is supported by the RPE in two ways. First, it represents a mechanical and tight barrier which separates the inner space of the eye from the blood stream. Second, the RPE is able communicate with the immune system in order to silence immune reaction in the healthy eye or, on the other hand, to activate the immune system in the case of disease (Fig. 8). For these purposes the RPE can secrete immune modulatory factors such as interleukin-8 (IL-8) , complement factor H (CFH)[125, 126] or monocyte chemotactic protein-1 (MCP1) . Also the RPE is able to react to different factors of immune signaling cascades by expressing corresponding receptors. The receptors are MHC receptors [128, 129], toll-like receptors  or receptors for signaling molecules such as tumor-necrosis factor- α(TNF-α). Figure 8. Growth-factor signalling in the RPE. Stimulation of secretion by the RPE and summary of the secreted molecules by their functional role. Trigger for secretion are Ca2+-channels of the RPE. Abbreviations: ATP, Adenosine triphosphate; CFH, complement Factor H; CNTF, ciliary neurotrophic factor; FASL, CD95 apoptosis receptor ligand; FGF, fibroblast growth factor; IL, interleukin; IGF-1, insulin-like growth factor-1; LPS, lipopolysaccharides; PEDF, pigment epithelium-derived factor; PDGF, platelet-derived growth factor; TIMP3, tissue inhibitor of metallo matrix proteases; VEGF, vascular endothelial growth factor; TGF-β, transforming growth factor-β. Receptors: FGF-R, fibroblast growth factor receptor; IGF-R, insulin-like growth factor receptor; IL-R, interleukin receptor; MCP-1, monocyte chemotactic protein 1; TNF-R, tumor necrosis factor receptor; Toll-R, toll-like receptors; VEGF-R, vascular endothelial growrc, src-type intracellular tyrosine kinase. (Adapted from Strauss, 2009 ). The knowledge that the RPE is able to interact with the immune system has gained an increasing interest lately. Many types of retinal degeneration seem to be associated with an insufficiency to silence the immune reactions, for example, in age-related macular degeneration (See chapter by Hageman et al. webvision). On the other hand, an understanding of the immune privilege of the RPE is going to be helpful in the treatment of retinal degenerations by injected peptides, gene-therapy via viruses or in approaches using transplantation. 10. Mendelsohn C, Ruberte, E., Le Meur, M., Morris-Kay, G., Chambon, P. (1991) Developmental analysis of the retinoic acid-inducible RAR-b2 promoter in transgenic animals. Development 113:723-734. 131. Oh H, Takagi H, Takagi C, Suzuma K, Otani A, Ishida K, Matsumura M, Ogura Y, Honda Y (1999) The potential angiogenic role of macrophages in the formation of choroidal neovascular membranes. Invest Ophthalmol Vis Sci 40:1891-8.